In the weeks since the 2016 election results came in, many have wondered what the United States will look like under the incoming Trump administration. Women, in particular, are asking: What will become of my reproductive health care? It’s no secret that President-elect Donald Trump ran on the promise that he would ask Congress to repeal the Affordable Care Act (ACA). With his election on Nov. 8 came the real possibility that the ACA will be repealed in the near future, leaving many women wondering about their birth control options after Jan. 20 — under the ACA, birth control is free for those with health insurance. Kristyn Brandi, M.D., F.A.C.O.G., a family planning specialist at Boston University and Boston Medical Center, said she has definitely noticed an uptick in discussion about women seeking long-term forms of birth control in the days since the election — both in the media and among her own patients. “There are some patients who are expressing concern regarding access and cost to their [birth control] methods, particularly long-acting methods,” Dr. Brandi told HealthCentral in a phone interview. Taking away the ACA would especially affect low-income women, women of color, young women, and immigrant women, Dr. Brandi said. “I think there’s a higher concern in this population, but women in general are worried,” she said. On the day after the election, Google searches for the term “IUD” skyrocketed to an all-time peak in popularity. Many women took to social media to either express desire to get an intrauterine device (IUD) or implant before Trump takes office or to encourage others do so. But even before the election, more women than ever were considering long-acting forms of birth control. According to a study from the Guttmacher Institute, the percentage of females in the United States using these methods increased from 2.4 percent to 8.5 percent from 2002 to 2009. 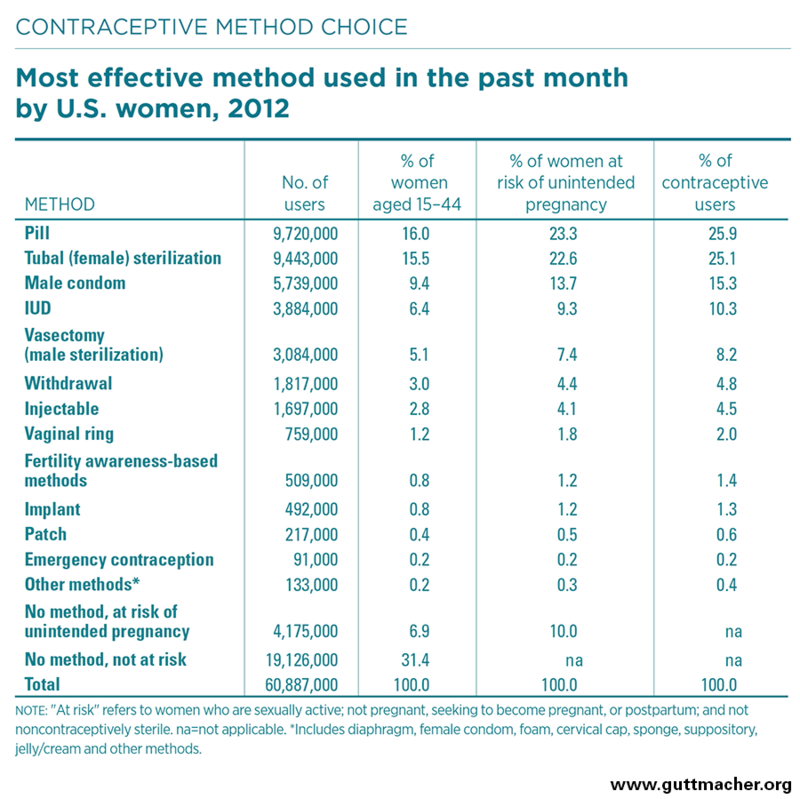 Of the two options, the IUD wins out in popularity. So what exactly is an IUD? According to the Food and Drug Administration (FDA), it is a t-shaped device that is inserted into a woman’s uterus by a health care provider to prevent pregnancy. Once it is inserted into the uterus, no other barrier method is needed to prevent pregnancy (but condoms should still be worn to help prevent sexually transmitted diseases). Dr. Brandi said she first breaks down the different types into two categories: nonhormonal and hormonal. Both types are more than 99 percent effective, making them two of the most effective forms of birth control available. And, along with the implant, IUDs are the most effective methods that are reversible (the other most effective methods are permanent — vasectomies for men or abdominal, laparoscopic, hysteroscopic sterilization procedures for women). ParaGard is the only nonhormonal IUD available. It works by releasing small amounts of copper into the uterus, which stops sperm from fertilizing an egg. ParaGard is the longest-lasting IUD available: It lasts for 10-12 years, Dr. Brandi said. The hormonal IUDs available include Mirena (which lasts five-seven years), Skyla (which lasts three years), Liletta (which lasts three years), and Kyleena (which lasts five years). According to the FDA, hormonal IUDs release a small amount of the hormone progestin into the uterus. The hormone thickens the cervical mucus, which makes it harder for sperm to reach the egg. It also thins the lining of the uterus. But is an IUD right for you? Maybe. Most women are candidates for the IUD, Dr. Brandi said, but the device is especially good for women who do not want to become pregnant for several years and women who do not want to have to remember to take a pill every day. Women with heavy periods also benefit from using hormonal IUDs because they make periods lighter, Dr. Brandi said. “We use the IUDs also for other types of things, like for emergency contraception, for treatment of women that have heavy periods — so there’s a lot of other benefits to using the IUD, in addition to preventing pregnancy,” she said. However, there are a few reasons why women may not choose the IUD, Dr. Brandi said. For example, some women like having a monthly period as a way to assure themselves that they are not pregnant. Because an IUD like Mirena may stop you from having periods completely, she said, it may not be the best option for these women. Additionally, someone who may not be able to tolerate a pelvic exam may not be comfortable with the IUD placement, Dr. Brandi said. Many patients worry that IUD placement will be painful — and it’s a legitimate concern, Dr. Brandi said. “It is uncomfortable, and it does cause cramping during placement, but there are a lot of things you can try to do to make patients feel comfortable — even just holding their hand and talking to them and making sure they understand what they’re going to experience before they experience it,” she said. Different types of anesthesia also may be available to make placement more comfortable, Dr. Brandi said. “If it’s something that you’re motivated [to do] and that you’re interested in, we can work around your concerns about pain and make you more comfortable,” she said. But if you feel like the IUD just isn’t for you, Dr. Brandi said, that’s perfectly OK too. Despite the recent fanfare surrounding the IUD and the increase in discussion about getting an IUD before Jan. 20, Dr. Brandi said, it’s important for patients to know that many other options are available if they just don’t feel like the IUD is the best choice for them. For example, the birth control implant is another long-lasting option (three years) that some patients may prefer. “There are so many different choices now that women have that they can find something that works for them,” she said. As an ob-gyn, Dr. Brandi said her goals won’t change, even if the country’s health care options do. “Our job is to take care of [women] regardless of what happens, so we’re going to continue to do that,” she said.